The Pinnacles: a small group of rocks in a deep sea. Tie-dye Arch: an easy dive when the swell allows. Cathedral Cove: a shallow ledge perching over a steep and deep drop-off. Scary Deep: its name says it all: a vetical drop-off. The Pinnacles of the Poor Knights Islands. 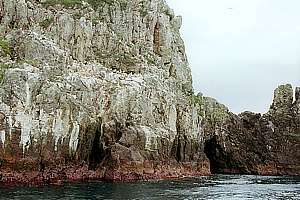 The Pinnacles and sugarloaf Rock are found south-west of the Poor Knights Islands. They are also fully protected by the Poor Knights marine reserve. On the map the boundary of the protection zone extends 800m from every outcrop above water, traced by the red dashed line.